This is a Hot Deal available today only. The Panasonic ES8249S Men’s 4-Blade (Arc 4) Wet/Dry Nanotech Rechargeable Electric Shaver with Vortex Cleaning System is available for $88.49 Shipped. The usual list price on Amazon is $249.99. Panasonic’s fully loaded men’s wet/dry washable electric shavers are packed with smart, innovative features that deliver a remarkably close and comfortable shave. The ES8249S is a four-blade (Arc 4) shaving system, which means more foils for better coverage and reduced shaving time. Also, the hypoallergenic blades and foils cause less irritation and are best for sensitive skin. 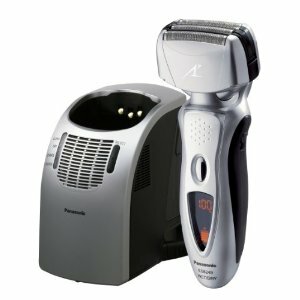 The Panasonic ES8249S Men’s 4-Blade (Arc 4) Wet/Dry Nanotech Rechargeable Electric Shaver with Vortex Cleaning System feature 30-degree-angle Nanotech blades to cut hair at its base for close, accurate precision. The flexible pivoting head allows the shaver to float effortlessly along the contours of your face for a fast shave, especially around your sideburns and the area under your chin. The fast linear motor eliminates tugging and pulling that can occur with slower shavers. This electric razor maintains peak power right up to the end of the charge, to ensure a consistently close shave. When the shaver’s Lithium-Ion battery needs recharging, simply insert the shaver into the automatic cleaning and charging system for a clean, renewed shave. It has 4.5 Stars with 300 Reviews on Amazon. Free Chips & Queso are Back at Chili’s!